This guide describe How to access Electronic Resources. Access to William C. Jason Library's Licensed Electronic Resources is accomplished through EZProxy. This application verifies the patron barcode number, DSU ID#, and last name against the LMS patron database files. Click on the login button. Your authorization will remain in place until you close your browser. 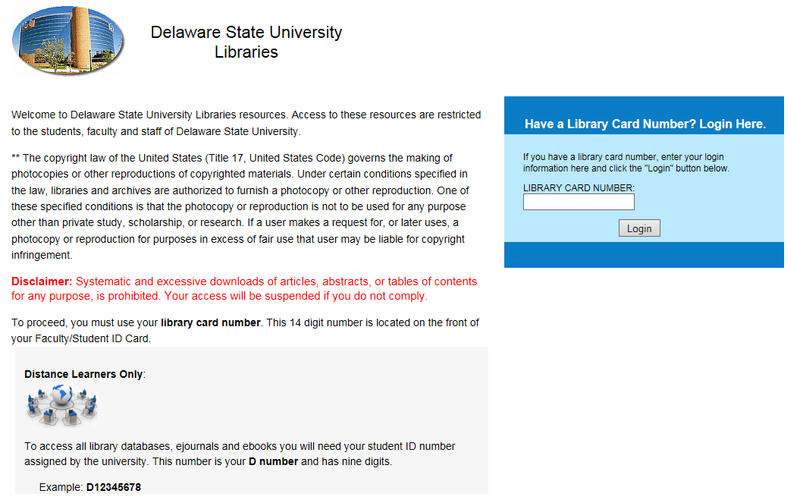 You are not a valid faculty, staff or student registered at Delaware State University Library. You are registered, but there is a discrepancy between our records and your patron ID number. Your privileges are blocked because of unpaid fines or charges for lost materials. You are registered with the Library, but not in a category with privileges to restricted resources (for example local community patrons).